Based on Michael Hall’s best-selling book My Heart Is Like a Zoo, Sticky Hearts turns his inventive animal creations into an interactive game. 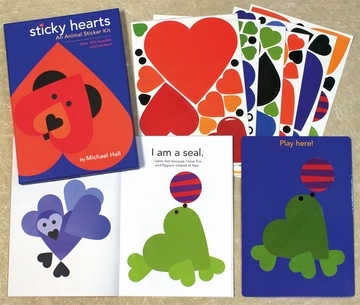 Children can select the appropriate reusable vinyl heart-shaped stickers to create 12 of Hall’s animals, each of which is shown in an accompanying booklet. A laminated board provides the perfect surface for arranging the hearts. Brightly designed and ingenious in its conception, Sticky Hearts teaches children how to discern the shapes and colors that comprise a picture and will likewise inspire them to create their own heart-animals. Can you make a seal out of four hearts and three circles? How about a lion out of six hearts and two circles? With Sticky Hearts: An Animal Sticker Kit, you’ll find out how to make both of these and ten other bright, funny creatures. Once you get the hang of it, you can make up your own sticker critters! 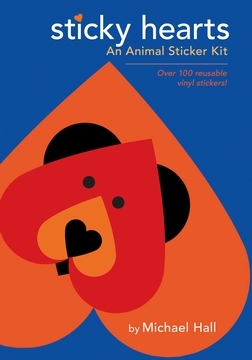 Based on the best-selling book My Heart Is Like a Zoo by Michael Hall (Greenwillow Books, 2010), this sticker set will provide hours of creative fun, whether you play alone or with friends. For example: Try making the twelve animals straight from the sticker sheets, without looking at them in the booklet. See who can put together an animal the fastest. Use the stickers to make up your own animals, and ask your friends to guess what they are. 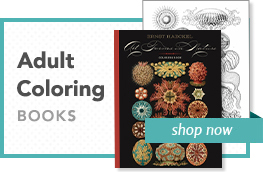 Sticky Hearts has received the Oppenheim Toy Portfolio’s 2012 Gold Seal Award, given to outstanding new products that enhance the lives of children.